While doing some research for wedding flower alternatives for a friend of mine, I happened along Estilo Weddings after not having been there for a while. I fell head over heels for this new collaboration between their shop and DK Designs. 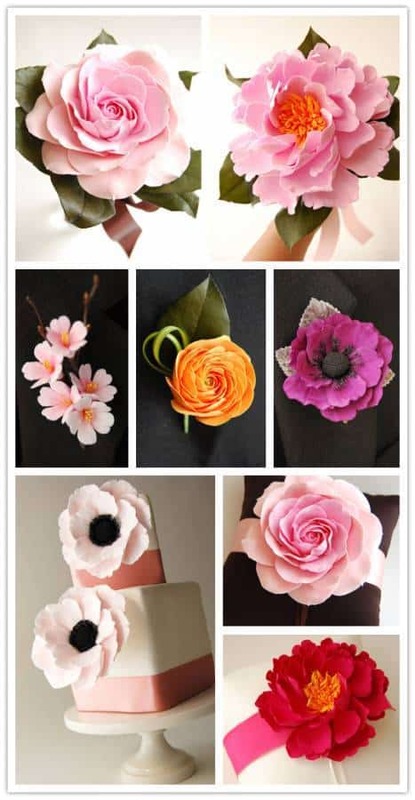 These fabulous flowers, made of clay, can be perfect keepsakes for your wedding and are available as cake toppers, ring pillow decorations, boutonnieres, single flower bouquets, and other wedding day accessories. Thank you for featuring our products! You have a very lovely blog! great post! i love estilo weddings as i love the cup cake holders and these are great! So beautiful and I can’t believe these are made of clay! Thank you for the lovely feature! Great blog! Oh! Those boutonnieres are too much! The cherry blossom one is to die for! WOW! These are made of clay? I’m truly impressed!! wow, veery impressive and such a great idea too – this way you can keep the flower practically forever.